Missing meals is a reality for too many students facing food insecurity. 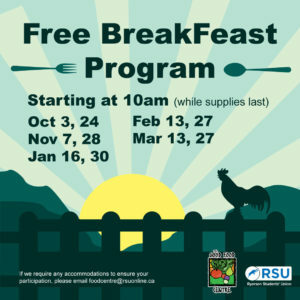 By providing free breakfast we are challenging food insecurity and building a campus community that cares. We are looking for volunteers interested in preparing breakfast on Tuesdays and serving Wednesday mornings. To register, please email foodcentre@rsuonline.ca with your name and phone number. This program is made possible through the support of First Evangelical Lutheran Church of Toronto. The Good Food Centre is one of six Equity Service Centres of the Ryerson Students' Union which also include RyeACCESS, RyePRIDE, The Centre for Women and Trans People, the RU Trans Collective, and the Racialised Students' Collective.